In an earlier post I did mention the Empi stroker pistons as a means of using a stroker crank without having to use spacers for the cylinders. Also Weber did make stroker pistons for the 30/36 hp engine. 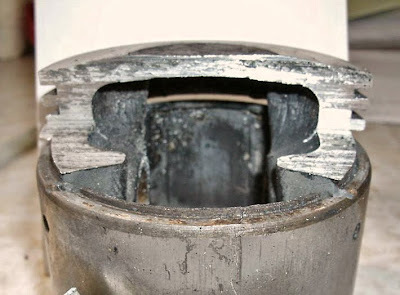 To find such pistons today is not easy as it is probably almost 50 years ago they went obsolete. Another option that is mentioned in sources from the time (late 50's/early 60's) is home-made dome pistons. This could be a good idea provided you have large combustion chambers, or want a very high compression. The benefit is that you can keep the width of the engine thus saving you the trouble of adopting push rods, engine tin and exhaust system. Jim from Ontario, Canada is trying the latter route and has done some very informative research. By sacrifice one of his pistons we now know how much material is left when doing the necessary 3 mm chamfering of the piston top. As can be seen it seems to be plenty material left. This combined with the fact that it was a "standard procedure" back in the days leaves me to assume that this is a safe modification. As Jim will be running stock heads the dome top helps him to get a decent compression ratio. In my case, I am afraid that by running Okrasa heads the dome will result in too high compression and/or interference with the valves. But with stock heads I would have chosen the same path as Jim. Sources: Souping the VW engine, Hot Rod Magazine June 1960, verbal conversations. Thanks Jim for letting me use the picture! ZAZ Zaporozhets, källa till delar? Pre-July 1957 cylinders = good for strokers!